Kobo officially announced their latest ebook reader earlier this week, the Kobo Forma. It has an unusual shape and design, and it’s the first Kobo ereader to emphasize reading in landscape mode by rotating the screen. The Kobo Forma has a unique sleepcover that accommodates reading in both portrait and landscape mode. 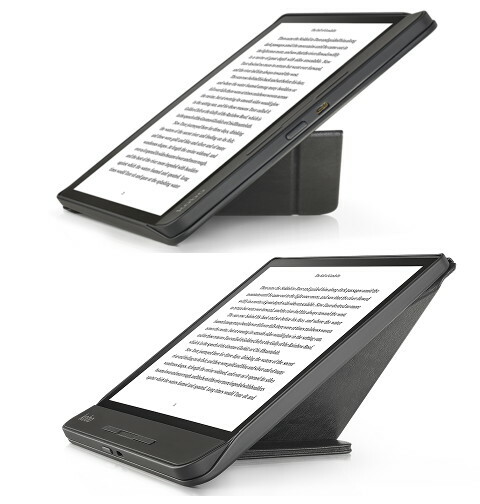 It has a creased front that can be folded into a stand to read in either portrait or landscape hands-free. This is the first ereader cover I’ve seen that can do both. Usually the stand feature only works for portrait mode. I really like the sleepcover for the Kobo Clara HD, and it works well as a stand (but only in portrait mode; the Forma is the first Kobo to offer landscape reading). The angle is different with the Forma’s cover, however. It’s less upright in both orientations, and it doesn’t look as sturdy as the Clara HD’s cover in stand mode. The Kobo Forma sleepcover is available in black and plum, and it sells for $50. The dual-stand feature looks cool but personally there’s no way I’m paying $50 for an imitation leather cover. The origami covers on both my Fire HD8 and 2nd gen Oasis support landscape and portrait hand free use. I’d figured that was the norm. I should have clarified that neither is the factory Amazon cover. 1 too expensive, and 2 not better than the alternatives. I was just pointing out that other covers offer this feature. Expect something from Amazon…I doubt Kobo is the only company that E ink pushed Mobius on. While the “money” is in Paperwhite, Clara range there is a market that is increasingly looking for larger readers…of course Amazon has noticed. The question is when will they go big. Before you think they abandoned customers, consider that hardware is only part of the equation, the other is ecosystem(ebook titles/pricing)…Amazon dominates this easily. I am glad both companies are around. Without the Oasis, there probably would be no Kobo Forma…the Forma will push Amazon(if nothing is already in the pipeline). The fact that they’re finally starting to use flexible Mobius screens on smaller ereaders is a big deal. I’m actually surprised it doesn’t weigh less considering the 10.3-inch Sony CP1 weighs 234 grams. Once they start using them on 6-inch ereaders they should only weigh like 100-120 grams. They could make the batteries bigger for longer battery life too and still make them a lot lighter than current models. The main reason I stopped reading paper books years ago (except when no ebook exists) is the increasing impact of my CP on my hands. This is also what makes the increasingly derided 6 inch form factor my favourite. The features on the Forma look awesome, it really seems much more appealing than the Oasis, but I think a hands-free stand would be a must for me, and other readers with similar physical issues. So I hope that you, or someone, will do a review of the Forma with stand, to help those of us who would find the larger device difficult to hold. On a related note, am I correct in assuming that the ONLY recent 6-inch ebook readers which physical page turn buttons are the Pocketbook series, which I can’t find reviewed here? I share Stuart’s worries and needs, for similar reasons (arthrosis). I’m also wondering whether the cover is proof against my unfortunate habit of accidentally leaning on my e-reader with my elbow, in bed. I’ve already murdered two Kobo e-readers that way, and the Kobo cover I bought for the second one didn’t help. And would the greater durability that Kobo claims for the Forma by having a plastic backing rather than glass plating also extend to resistance against local pressure? This cover is unlikely to provide any additional protection over the other cover but the fact that the Kobo Forma has a plastic backplane should render those kind of pressure breakages obsolete.